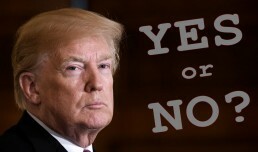 VOTE NOW: Should Donald Trump be impeached? Yes — He's a criminal and a danger to the country. No — He should remain president. By voting in this urgent poll, you are contributing to our efforts to ensure that America’s voices are being heard. You will have the added benefit of receiving regular updates from OD Action. You may unsubscribe at any time.